Simon & Schuster, 9781476708690, 560pp. “A sprawling companion to his best-selling Steve Jobs . . . this kaleidoscopic narrative serves to explain the stepwise development of 10 core innovations of the digital age — from mathematical logic to transistors, video games and the Web — as well as to illustrate the exemplary traits of their makers. . . . Isaacson unequivocally demonstrates the power of collaborative labor and the interplay between companies and their broader ecosystems. . . . 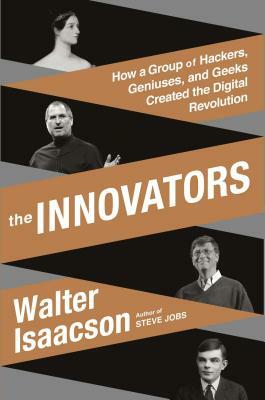 The Innovators is the most accessible and comprehensive history of its kind. "[A] tour d’horizon of the computer age . . . [The Innovators] presents a deeply comforting, humanistic vision: of how a succession of brilliant individuals, often working together in mutually supportive groups, built on each others’ ideas to create a pervasive digital culture in which man and machine live together in amicable symbiosis. . . . a fresh perspective on the birth of the information age."